COST: $25 per person. Price includes book. Scholarships and group/team discounts available. Registration is open until April 23 and is first come, first served. 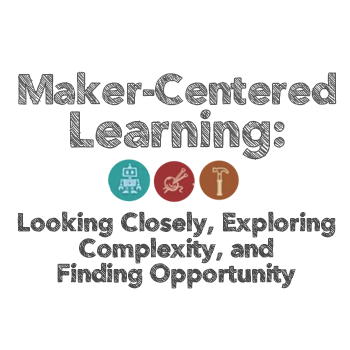 Held in conjunction with the Peabody Essex Museum in Salem, MA, this two-hour interactive workshop explores the framework for maker-centered learning as described in the book Maker-Centered Learning: Empowering Young People to Shape their Worlds. As educational initiatives that emphasize making, engineering, and tinkering become increasingly popular in K-12 education, how can these practices be applied across the content areas and within interdisciplinary settings? What is truly worthwhile about maker-centered learning? What are the most salient benefits of the maker-centered experiences? Project Zero researchers Edward Clapp and Andrea Sachdeva will present a series of hands-on activities aimed at exploring these questions and considering how pedagogical practice can support the core principles of maker-centered learning. Participants will consider what it means to develop a sensitivity to the made dimensions of the world by looking closely, exploring complexity, and finding opportunity, all the while making connections between these concepts and their home teaching and learning environments.